Wing Chun Peru: Lima Sifus, History, and Future? I wanted to know if Wing Chun, Peru, and kung fu existed in harmony. More importantly, if it did, how good is it? Is it real Wing Chun kung fu? Or, is it just a bunch of self-proclaimed sifus who really don't know anything about Wing Chun? This journey started at a get-together where I met the cousin of a friend who was visiting from Peru. The conversation turned to martial arts. He studied Tae Kwon Do, so I told him I practice Wing Chun. As soon as I said that he said, “Oh, I know what that is." I asked what he meant, thinking he saw the movie Ip Man or something like that. It turns out he studied Wing Chun for a little bit when he was young. I started drilling him for information to find out who his Sifu was. Were there others? What lineage does his father study? How many Wing Chun schools are there in Peru? Sadly, he didn’t know anything. End of story I thought... well, almost. A few weeks after the get-together, the chance to visit Peru came up (things happen for a reason). I got to work and looked for Wing Chun sifus to interview while I was in country. Truth is, other than my friend's cousin's father's sifu, I wasn't confident if I'd find any other Wing Chun schools. It’s not easy to find proper Wing Chun classes in most parts of the world, Peru is no exception. The good news: after much work and follow up I got in touch with three sifus who agreed to meet. Who is Choy Fong Lum? 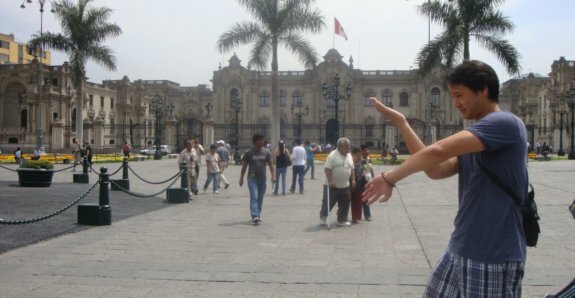 Wing Chun exists in Peru! Here, Wing Chun has a history that is intertwined with Hung Gar, and it stretches back to at least the 1930s. That's when Grandmaster, Choy Fong Lum (also spelled Choy Fook Leoung), arrived to Peru. Grandmaster Choy Fong Lum was born in 1892. Around 1930, he left his wife, his children, and his life in China because there was a price on his head, according to sifu Ricky Leturia who trained directly under grandmaster. "There were Communists, the KMT, and a Japanese occupation. It was an unstable time in China," says sifu Ricky. He moved to the U.S. first, then to Peru, and decided to permanently live in Peru because it reminded him of home (Canton, Fujian, etc.). Before moving away from China, however, his father taught him kung fu. Like tradition, his father was his first kung fu teacher. But that didn't last long. He soon became a student of Hung Gar grandmaster Huang Fei Hong (who is a legend in China and in which many Kung Fu movies are made, i.e. Drunken Master, Magnificent Butcher, Once Upon A Time in China, etc.). Master Choy studied with him for five years. Master Choy also was a direct student of Wing Chun grandmaster Chan Wah Shun (who was one of Ip Man’s Wing Chun teachers), and studied with him for three years. Grandmaster Choy Fong Lum Was the Real Deal! Unfortunately for the world of Wing Chun and Kung Fu, grandmaster Choy did not start teaching until the 1970s, when he himself was in his 70s. Indeed, we’re all lucky, Peru especially, that in his advanced age he realized it was important to spread his unique knowledge of Kung Fu. But perhaps, many more would have learned if he started teaching at a younger age. One great thing he did was to begin teaching "outsiders," not just the Chinese (Bruce Lee and Master William Cheung started doing the same thing around the same time). This definitely helped spread Wing Chun worldwide. Master Choy taught at the “Cu Con Chau” (also spelled Ku Kon Chau), a well known Chinese-Peruvian cultural center and Buddhist temple located in Lima's Chinatown. Grandmaster Choy taught in the hard traditional way. If you’ve ever watched a kung fu movie where the disciples go through brutal physical training... this is exactly how he taught back in the 70s... and how he learned from grandmasters Huang Fei Hong and Chan Wah Shun. One of his original students told me the first three months (or longer) of training, your “lesson” was to sit in the horse stance for two hours. That’s it. That was your lesson. If you didn't like it, or if it was too hard, you could leave. Grandmaster Choy didn't need you as a student. Brutal! Only a handful of students moved on to teach and become sifu’s themselves. From what I could tell, grandmaster Choy’s legacy consists of at least three generations of Kung Fu fighters in Peru today. I was fortunate to interview two of grandmaster Choy's students: first-generation sifu Ricky Leturia and second-generation sifu Luis Ramos. Both are sifus today and spreading the art in their own ways. Like many sifus around the world, attracting quality students is a challenge. Teaching in the old, hard way isn’t a practical option anymore. Students don’t have the time or patience to go through such a training regimen (hold the horse stance for two hours at a time). Most people want to learn cool moves quickly. Also, there’s much more competition and selection today. Today’s students tend to jump around and pick up the next coolest martial art; even though they never master the one they’re learning now. Another wrinkle that will affect Peru’s Wing Chun future is the introduction of a more direct Ip Man line of Wing Chun. In the early 2000s a new sifu, sifu Marcos Sanz, immigrated to Peru. Originally from Spain, he learned Wing Chun in Argentina (via Moy Yat's line) and now teaches Ip Man style Wing Chun in Lima, Peru.